FILE - Kurt Volker, United States Special Representative for Ukraine Negotiations, speaks during an interview with Reuters in Kyiv, Ukraine, Oct. 28, 2017. U.S. Special Envoy for Ukraine Kurt Volker says he is scheduled to hold a new round of talks with Russian presidential aide Vladislav Surkov in Dubai on Jan. 26. Volker told VOA's Ukrainian Service that he will arrive in eastern Ukraine on Wednesday and stop in Kyiv on Thursday, before heading to Dubai to discuss the war in eastern Ukraine and prospects for the introduction and possible format of the peacekeeping mission. 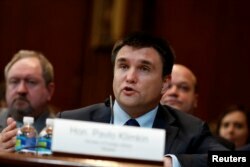 FILE - Ukrainian Foreign Minister Pavlo Klimkin testifies before a Senate subcommittee on Capitol Hill in Washington, March 7, 2017. Kyiv, he said, is curious to see "how we can use new U.S. sanctions" to forge some kind of sustainable peace plan.